Blogger has now added a Permalink feature in its platform. Now the users can easily select their own custom link. The older version offered automatic link creation creation. This automatic link creation used to take the blog title and made it link. The problem was there in bigger blog titles. There was a limit of words that were selected from the start of blog title and were displayed in blog link, rest were dropped. This drop of words usually dropped the important keyword from the link because that keyword was placed after a number of words in blog title. This could be overcome by creating a title with keyword in the beginning. Still, you cannot always help yourself with that. 1. 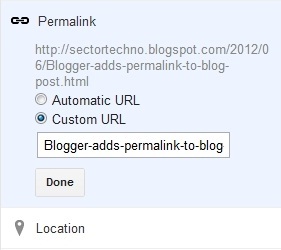 Link- This permalink feature allows you to put the entire blog title in your link. 2. Multiple keywords- Sometimes when you do keyword research, there are more than one keyword that can possibly get you a good amount of search traffic. But you can have only one keyword in blog title, but now you can include both the keywords by adding one in your blog title and other in your permalink. This will provide you with high amount of search traffic, that means, blogger is now more SEO friendly. Simply, click on permalink tab and and select custom URL option. Add your desired words in custom URL bar. These words are added after the archive date. For example, in this link http://sectortechno.blogspot.com/2012/06/Blogger-adds-permalink-to-blog-post.html, /2012/06/ is the archive date and Blogger-adds-permalink-to-blog-post is what to add. While creating these links, you are allowed to add only underscore(_) and hyphen(-) between the words. Spaces and all other characters are not valid for html links.